JEFFERSON CITY (AP) -- The Missouri Supreme Court has struck down new state Senate districts and ordered a further legal review of new U.S. House districts. The rulings Tuesday add fresh uncertainty for the 2012 election year, just weeks before candidates are to begin filing for office. The Supreme Court rejected new state Senate maps submitted a special panel of judges. That means the redistricting process must start over, with the governor appointing a new, bipartisan citizens commission to draw Senate boundaries. 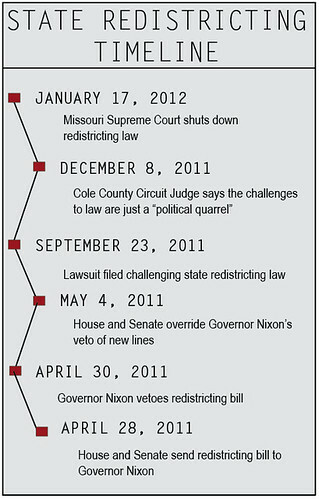 The high court also ruled that a trial judge must consider further legal challenges to the boundaries for Missouri's U.S. House districts, which shrank from nine to eight as a result of the 2010 census. The Supreme Court ordered the trial court to act by Feb. 3. A summary of the appeals can be found online here. The court's decision can be found online here.